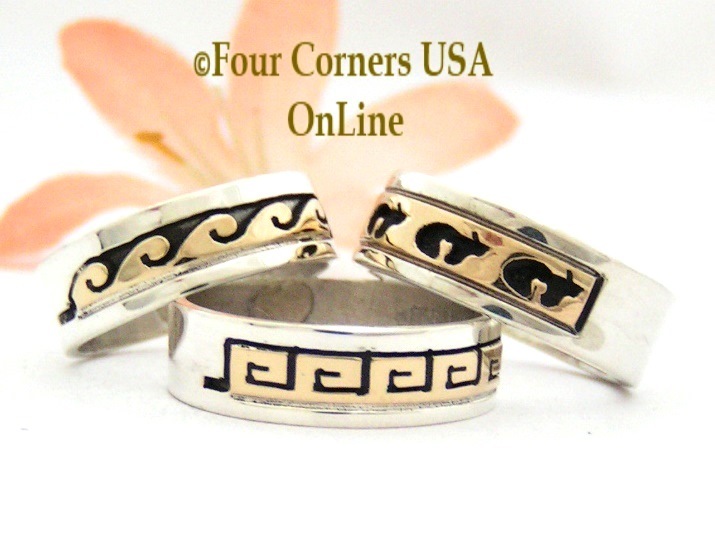 Native American Navajo Artisan made Band Rings for both Men and Women in all Sterling Silver and Mixed Gold Silver, a Skeets Family Signature with symbolic designs including Wave Rings, Spirals, Native Rug Patterns, Greek Key, Hopi Wedding Pattern. These time honored classic Sterling and Gold Band Rings are wonderful fashion statements as well as replacement Wedding Band Rings, Anniversary Gifts, Commitment Rings or just signs of affection. Native American Band Rings are a wonderful alternative to traditional or socially expectant Wedding Rings and a true expression of your personal style.